grandeur of the structure. Originally, the stairs were faced with grey Trieste sandstone With time, however, the sandstone weathered and was replaced with granite. 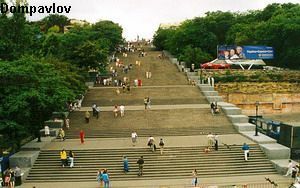 The famous Potemkin Stairs serve as a symbol of the city. It has recently been complemented with ramp over bridges to extend as far as the Novy Pier, where a modern structure of the new seaport is located on a high platform. Memorial plagues state that it was on precisely this spot that the first Odessa buildings were founded in 1794.